Wanted: Gifted People for Great Jobs! When you think about it, the guys and gals who take on professional charter bus driving jobs are pretty gifted. They must be excellent drivers with the stamina, disposition, and aptitude to safely operate a 20-ton passenger vehicle, day and night, rain or shine, over terrain both familiar and unfamiliar. But they also need to excel in trouble-shooting, vehicle maintenance, conflict resolution, emergency management, customer service, and even small talk. In a job that requires a blend of driving skills, mechanical skills, and people skills, it’s hard to put bus drivers into any single occupational category: Safety? Transportation? Travel and tourism? Hospitality? Diplomacy? A bus driver must be proficient in all of these areas — with a healthy dose of mechanical aptitude thrown in for good measure. Passenger safety is a professional bus driver’s number one priority. Most states require drivers of Commercial Motor Vehicles (CMVs) to obtain a Commercial Driver’s License (CDL) signifying that they’ve passed rigorous tests geared to the highest standards for knowledge and skills. Drivers must also pass a drug and alcohol screening and a qualifying physical exam (to rule out heart trouble, seizure disorders, sleep apnea, or any other condition that could interfere with safe driving). To prevent fatigue, drivers must adhere strictly to the hours-of-service regulations established by the Department of Transportation (DOT). And, of course, they should possess, and maintain, a good driving record. While safety is the driver’s number one priority, his or her primary job function is transportation: getting groups of people from point A to point B and back again. And by “groups of people,” we mean school kids, business travelers, sports teams, church groups, civic organizations, social clubs, day trippers, commuters, and anyone else who needs to get from here to there. We’ve all seen bus drivers on the job, where they spend around 70 percent of their time driving and five percent of their time loading and unloading passengers and baggage. The remaining 25 percent of the job takes place behind the scenes. Drivers spend around 10 percent of their time planning trips and coordinating itineraries with company personnel and other drivers, five percent on maintenance and inspections, and another five percent on training and professional development. The final five percent of a driver’s time is devoted to paperwork. “Travel and tourism” can be defined as the business or industry of providing information, accommodations, transportation, and other services to tourists (i.e., people who travel outside of their usual environment for leisure or business). So, when people use a charter bus for vacation travel, group tours, family reunions, and business trips, they are engaging in travel and tourism. Drivers play a part in the overall customer experience and, at times, when knowledgeable of the local area, can offer commentary of sights and attractions, answer questions, and help passengers navigate their way through unknown territory with the help of GPS and the route plan from their customer service representative. Which brings us to the topic of hospitality and customer service. The motorcoach company provides luxurious amenities and comfortable transport — with reclining seats, footrests, individual climate and lighting controls, WiFi, and DVD players. The chartering group may provide beverages, snacks, and even entertainment on the bus. The driver serves as the ambassador of customer service, fostering the spirit of hospitality throughout the trip. On a long trip — no matter how comfortable the bus, how smooth the ride, how ample the amenities — there may come a time when some people get restless, tired, rambunctious, irritable … or all of the above. This is to be expected. The bus driver just can’t be one of those people. Likewise, in heavy traffic, whether it’s caused by construction, an accident, rush hour, weather, or a combination of factors, certain motorists may get impatient, frustrated, and angry. That’s human nature. The bus driver just can’t be one of those motorists. A bus driver must be well rested, even-tempered, and well suited to the demands of long hours with little entertainment, exercise, or breaks. The driver is the one who has to stay cool so that no matter what’s happening outside the bus, the world inside the bus is a cocoon of calm. 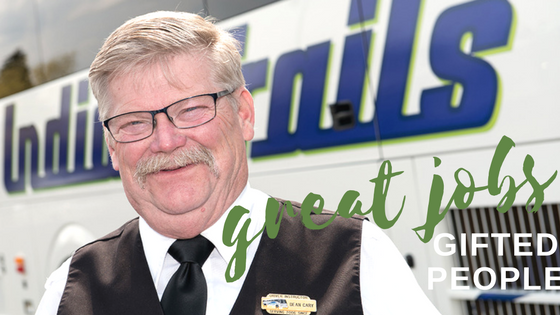 Visit Indian Trails employment opportunities and see current open positions here.